This is a book ripped right out of the headlines. If you want to understand what's going on in the Middle East right now then this is a great book to start with. 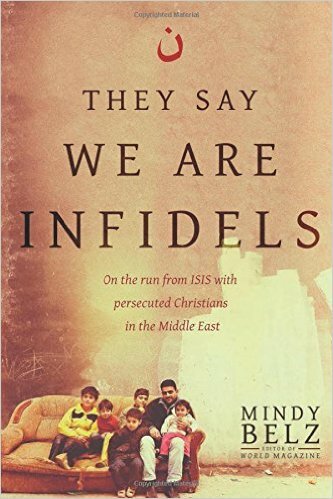 Mindy Belz is a reporter for the Christian (and leaning in a Reformed direction) news magazine WORLD, and she has visited the Middle East repeatedly over the last dozen some years. This is an account of those many trips, and the stories of the Christians she met, and how their lives were impacted by the US invasion of Iraq. It wasn't just Iraqi Christians that were impacted. Belz outlines how all of the Middle East was, and continues to be, impacted by the US activities in the area. For example, after taking out Saddam in 2003, the US made the decision to also fire anyone with Ba'athist ties. The Ba'ath Party was Saddam's political party, so this seemed to make sense. The problem was, being a member of the Ba'ath party was a basic requirement for most important positions. So in this one move the US basically required that anyone and everyone involved in the former political infrastructure of the country be booted out. So all the military personal, the policemen, mayors, etc....all gone. And with them went the country's stability. Policing the entire country was a task beyond the US's ability. They had to restrict themselves to instead securing certain areas. But those outside those areas were left to fend for themselves. The US also, in taking down Saddam, replaced a dictatorship that, while certainly not friendly to Christians, at least offered some limited protection to them. Belz shows how, after the invasion, Iraq's Christians were hopeful, and making all sorts of plans. But it soon became clear that their situation was worse than it had been under Saddam. The country adopted an officially Islamic constitution, and Christians outside of the areas where the US reigned were faced with increasingly hostile persecution. Church leaders started getting murdered. Church buildings were blown up. And then ISIS came and it all got so much worse. The point of Belz' book is not to try to blame the US for all of the Middle East's problems. The villains are the Islamic terrorists like ISIS and their many supporters and sympathizers. But it does become apparent, in reading one accounts after another, that for Iraq's Christians, the US invasion did not lead to any improvements for them. They continue to flee the country in droves, and whereas there was once a small Jewish company in Iraq, they may well be all gone now. This is an eye-opening book by a Christian author who is certainly not anti-American. But her account show that George Bush's aim of spreading democracy across the Middle East was and is a naive one. Democracy can only flourish when a country cares enough about protecting its minorities that the majority will even offer up their own lives to protect the persecuted. That is not happening in the Middle East, or at least, not in the numbers needed. I should add that Belz also addresses what is happening in Syria and surrounding countries too. Iraq is the main focus, but not the only one. While this is an incredibly eye-opening story, I did find it took effort to work through – this is no light read. But if you want to know what our persecuted brothers and sisters in the Middle East are having to put up with, then your should grab a copy of They say we are infidels. You can pick one up at Amazon.com by clicking here or at Amazon.ca here.